June 18 – 24th is National Pollinator Week, a week that celebrates the importance of pollinators and spreads awareness about their rapid decline. SugarCreek is joining the education effort by answering some frequently asked questions about our very own beekeeping project! Q: What do the Bees eat? A: Bees eat and drink flower nectar and pollen. However, new hives often need a boost to get started, so some beekeepers choose to feed their bees a mixture of water and sugar to start out. Bees will eventually forage for their own sustenance from wild flowers, but feeding them at first helps to establish the hives. 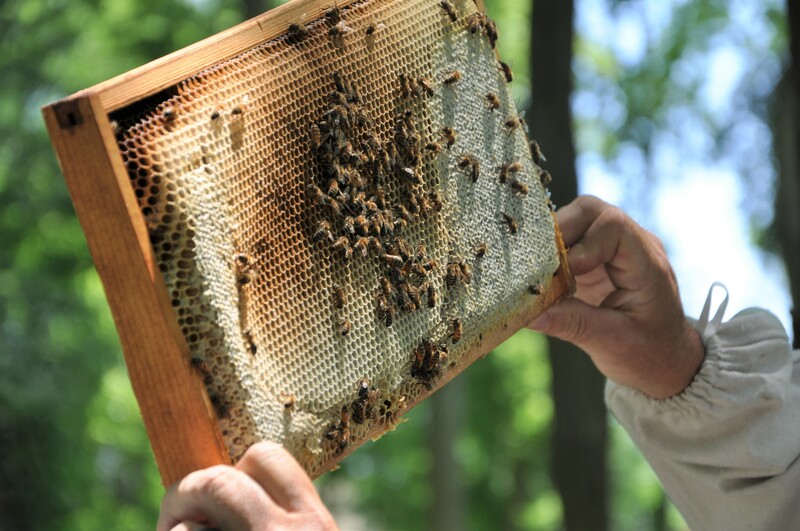 Currently, Beekeeper Pete Motza feeds the SugarCreek bees twice a day. Q: How long does it take for Bees to produce honey? A: A new colony of bees, such as the bees at SugarCreek, need a full season to build up a large enough population in order to produce honey. 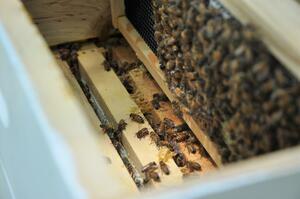 There are many factors, such as weather, that can affect the speed at which bees make honey. Every hive is different! That’s why it’s important to regularly check the hives in order to monitor their progress. Q: Will the bees sting? A: It can be unnerving to approach a bee hive, and one should never do so without the proper equipment. Beekeepers use something called a bee smoker, which works to calm the bees and prevent them from stinging. The bees interpret the smoke as a signal of a forest fire and they prepare to leave their hive by eating as much honey as possible. This makes them lethargic and they become too slow to attack or sting. Visit http://pollinator.org/pollinator-week to find out more about Pollinator Week and to find local Pollinator Week Events!